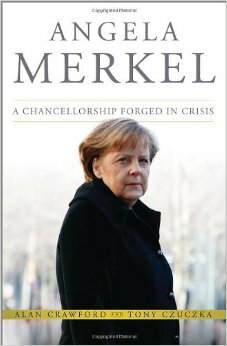 “Angela Merkel” by Alan Crawford and Tony Czuczka is not a conventional biography of the leading political figure in Europe. Rather it is an exploration of her approach to politics around different themes…..her approach to the United States, her response to the Greek crisis, to the nuclear question, and the future of the European Union. Her style is different from her predecessors Helmut Kohl, and Gerhard Schroeder. She would never have taken Schroeder’s strong stand against the Iraq War because of her emotional pro Americanism, something that flows from having dreamed of America while growing up in Communist East Germany. She does not have Kohl’s emotional commitment to European political Union. Kohl, whose life was seared by the effects of family losses in the two World Wars, wants to merge Germany into a united Europe to prevent future wars. It is something about which he is deeply emotional. Merkel’s approach is more practical, and more in tune with the feelings of ordinary debt averse Germans. She will pay a price to keep Europe together, but not any price. She is not as committed to common European Institutions, like the sole right of legislative initiative of the European Commission, as Kohl was, and is more likely to make deal with a small number of other heads of government of bigger states, bypassing the Commission. This is risky for smaller EU nations. But small nations, by insisting on one Commissioner per member state , have contributed to a weakening of the Commission. Her approach to all political questions is shaped by her training as a scientist. She looks for lots of evidence before making a decision. She avoids visionary statements, but works through the evidence until she finds a basis for a decision. The weakness of this approach is that, in the absence of a grand vision into which decisions can fit, German public opinion may not be adequately prepared for the decision when it is finally taken. She makes no effort at all to paint a picture of the future of Europe that would inspire the continent’s 500 million people to make sacrifices to build a joint future. But if the German Chancellor does not paint such a picture, who else has the stature to do so? Her pragmatic, cautious, and scientific approach also presumes a degree of rationality and shared interest on the part of her antagonists. Although she is a fluent Russian speaker, she does not seem to have achieved any common ground with Putin. She may be having a similar experience with Alexis Tsipras of Greece. This is good book but I finished it, feeling that I had acquired a good knowledge of Angela Merkel’s tactical approach to politics, but no greater understanding of her deeper motivations.